Glasgow Kiss is an instrumental off of John Petrucci’s 2005 solo album, Suspended Animation. It’s a fast and interesting song that gives you a great alternate-picking workout. There are some great licks during the second half of the song, but the lick I’ll spotlight here is the main lick/riff. This lick sets the tone for the first half of the song and is a great lick to study and work on. According to Google, ‘Glasgow Kiss’ is slang for a headbutt. I’ve never been to Scotland, so I have no idea how violent the city really is, but I can imagine this song kicking in at the start of a fight at a pub. 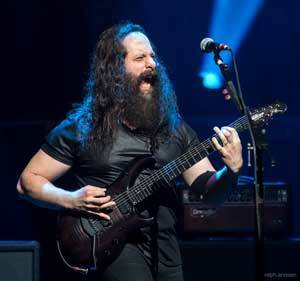 John Petrucci is the guitarist from the band Dream Theater. He’s well known amongst guitarists for his incredible technique, melodic soloing, and complicated odd-time signature riffing. His signature Majesty guitars by Music Man are one of the most impressive signature guitars you’ll find. I’ve always been more impressed with John Petrucci’s musicality over his technical skills. While he’s a technical powerhouse, his creativity and melodic writing is incredible. He can come up with incredibly soulful and calm melodies as well as full face-melting solos. Studying his solos is a great way to see how to apply all of these complicated techniques in a way that doesn’t sound like exercises. The second half of this song is a great example of his ability to craft interesting lead ideas. Here’s the main riff to the song set at a demanding 207bpm tempo in 12/8. Use strict alternate picking and make sure each note is separate or you’ll end up with a mess. You might also want to experiment with using some slight palm-muting to add a percussive element to your tone. The fast alternate picking style fits perfectly with the bagpipe inspired melody. There’s something about fast alternate picking with some nice thick distortion that feels fun to play. John takes this melody and shifts it up an octave, which is just as fun to play. After you learn the above lick, try figuring out on your own how to shift it up an octave (starting on the fourth string). The way the lick moves around is interesting to play. It stays in the same area of the fretboard, so you should find it easy to plan out which fingers to use for each note. I learned this lick by ear shortly after the song came out and didn’t put much thought into which fingers to use. It was only after I saw John perform the song live that I noticed he uses different fingers for half of the lick. I used my first ring finger on the 10th fret in the last bar, while he uses his pinky. After playing a lick one way for a long time, it can be tough to change the way you play it. I’ve tried to change the way I play it to match the way he plays it, but old habits die hard. I still find that my old way of playing it creeps in without me noticing. This is a good lesson to remember: the way you learn something will likely stick with you for a very long time. So take extra time and effort in the early stages to get it right. While there’s nothing wrong with the way I play it, I should have put more thought into which fingers to use. If I took the time to think about it carefully, I would have learned the ‘correct’ way of playing it from the very beginning. This lick is in E Mixolydian, which is the fifth mode of the A Major scale. If you know your modes, the only difference between E Major and E Mixolydian is the b7 (D# becomes D). Look through the above lick and look out for the times it uses the note D. As soon as you hear that note, you’re hearing Mixolydian. This is a great example of how modes can inspire your playing and take things in new directions. If you’re used to hearing the real lick, this version will sound off. But after you play it a few times, you will hear that it sounds like a normal Major riff. It’s not very interesting when played in E Major, but sounds interesting as soon as we change it to E Mixolydian. Changing that one note completely changes the feel of the riff. If you’ve never experimented with modes before, try taking the above lick and transpose it into different modes such as E Dorian and E Aeolian. This is a great way to truly learn modes. Every time you do this, you’ll develop a stronger understanding of what each mode sounds like and when to use them. With a fast lick like this one, accuracy matters. There’s a big difference between just being able to play it at tempo, and playing it with ease at tempo. If you feel tense or struggle to keep playing it over and over at full speed, slow it down and gradually build it back up to speed. When you hear John play it, you don’t hear him struggle in any way. Your goal should be the same – work on it until it feels completely natural and relaxed. Use a metronome and gradually build up the tempo. I used Guitar Pro’s speed trainer tool to gradually increase the tempo on each repeat. I explain how to do this in Step 4 of this article. Depending on your current skill level, you might be able to master this lick in a couple of days, or it might take you months. But it’s worth the effort to work on a lick like this. Just think of how much better your picking accuracy will be if you can effortlessly play this lick at full speed. I like to use some slight palm-muting to give the lick a bit of a percussive feel. You might want to practice it using some palm-muting as it will keep your picking hand stable. A nice thick distortion sounds great with this type of lick. While you might be tempted to throw in some delay, avoid using it while learning the lick. Keep the gain fairly low when practicing so you can hear any mistakes in your playing. A lot of guitarists use high levels of gain to hide imperfections. Use a dry and low gain tone when practicing, then add gain after you’ve mastered the lick. You’ll end up with much better results. 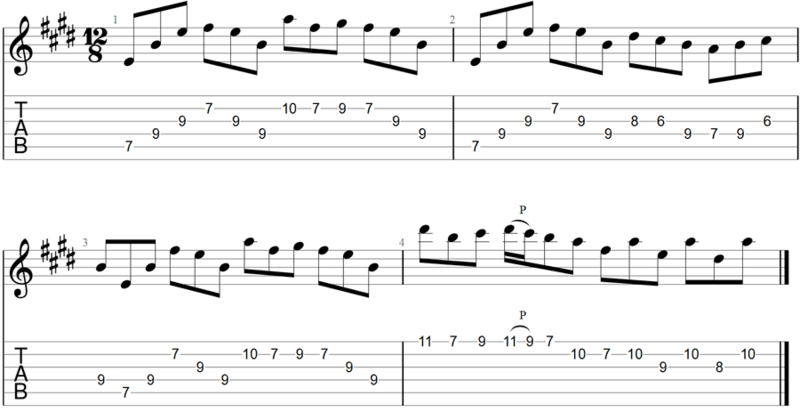 This lick is a great example of how modes can shape and color your music. If you’re interested in learning about modes and how to apply them in your music, I can help you with my Skype guitar lessons. Using this lick as a starting point, we can explore all the other modes and learn to switch back and forth between modes. Then we can look at how to write similar licks to this one in Mixolydian or any other mode. If you’re interested in writing your own songs in a similar style, we can use this song as a starting point. We’ll analyze the entire song, then I’ll work with you to write your own song in a similar style and structure. While learning this song note for note might be fun, imagine being able to write your own song in a similar style. I can even help you put a backing track together so you can jam along with your song. If this is something you’re interested in learning, contact me here to talk about what you’d like to learn in lessons with me.